Expand your freedom in the highly-anticipated 2018 Toyota RAV4 Trail Edition. This stunning four-door vehicle elevates performance and style as it comfortably seats five with plenty of room for cargo. Expanding on the XLE trim level, the 2018 Toyota RAV4 Trail enhances your driving experiences with modern luxury and convenience features. Enter the cabin with ease through the keyless entry as push-button start increases functionality. Sophisticated details emerge, such as with the chrome inner door handles and soft-touch instrument panel with stitching. Comfort and support are yours with the heated front bucket seats as the 8-way power adjustable driver seat enables you to find the perfect position, no matter how long the drive. With the leather-wrapped and heated steering wheel, you can access your settings through the mounted audio and Bluetooth controls without removing your hands from the wheel. Open up to the sky above with the power moonroof as you experience wide open views and fresh air. 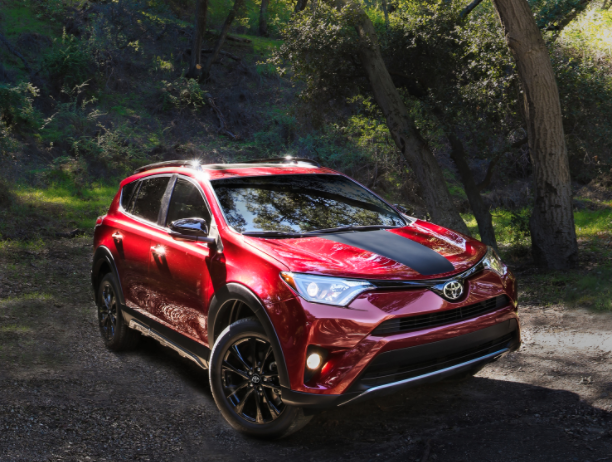 From its unique Trail badging to its advanced aerodynamics, the 2018 Toyota RAV4 Trail emerges with a highly coveted design. An exclusive black hood decal and black halogen headlamps elevate the design as the 18” Black Alloy Wheels promote the capability of the increased ground clearance with durable traction. 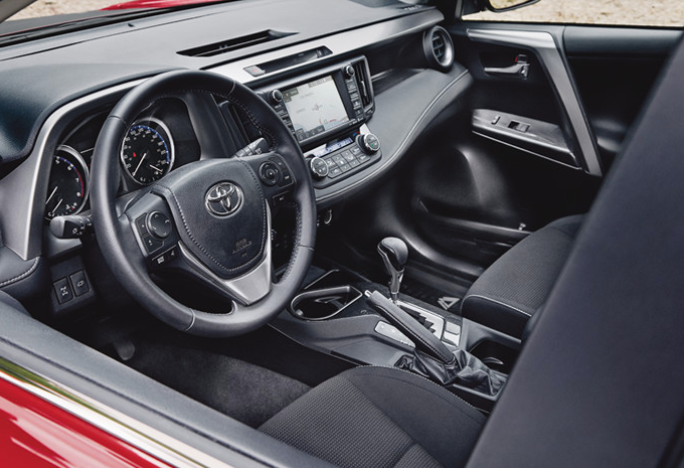 Endless connection possibilities are found with the 2018 Toyota RAV4 Trail as you embrace the hands-free technology of the 6.1” Display Audio System. Through SIRI Eyes Free you are given advanced Voice Recognition capability while the Bluetooth system brings you into contact with your compatible devices for hands-free calling, messaging and more. Every 2018 Toyota RAV4 Trail is customizable through a series of Genuine Toyota Parts and Accessories so that you can enhance the areas that are important to you. Utilize the cargo and floor mats to help keep the interior of your Rav4 clean, as the addition of a paint protection film works to protect your exterior. Enhance towing capabilities through the towing hitch ball platform and wire harness as you embrace the increased towing capacity of this remarkable Trail Edition. Unleash your potential in the 2018 Toyota RAV4 Trail as you make the most of each moment on or off the road. You are given an enhanced towing capacity of up to 3,5000 lbs, a remarkable upgrade from the standard 1,500 lbs. A suspension lift creates a higher ride height, with improved ability to face new challenges as the 6-speed automatic transmission delivers dynamic responsiveness and enhanced control. Do not let anything hold you back as you seek out new adventures in the 2018 Toyota RAV4 Trail. With its enhanced design features, increased ground clearance and modern technological advances, you can conquer anything that you put your mind to. Test drive the 2018 Toyota RAV4 Trail today at your local Edmonton Toyota Dealer – Gateway Toyota. No matter which vehicle you have in mind, Gateway Toyota is here to help you find the best deal in the market so that you leave confident and satisfied.